A day that takes its sweet time passing. Breakfast and coffee at the reliable Parker-Lusseau, where it's too early to eat cake with ladyfingers and lemon custard wrapped in rose-tinted white chocolate. Hwy 1 to Big Sur. A wall of fog stretches across the Pacific. As it nears the land, it becomes a white cloud that obscures mountains, homes, trees. 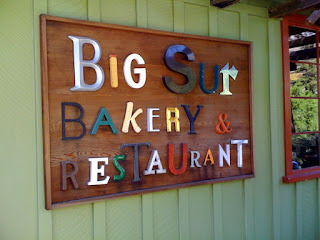 To the Big Sur Bakery and Restaurant for chocolate chip cookies. The cookbook includes profiles of the owners (originally from LA), people who work there, and suppliers (beekeepers, organic farmers, growers of microgreens). I think of Werner Herzog's film Encounters at the End of the World, in which Herzog goes to Antarctica to learn about the people who live there. To Ventana for the legendary view from the restaurant, which we find is closed for remodeling. We honestly don't care. The view from a bench below the restaurant is just fine. 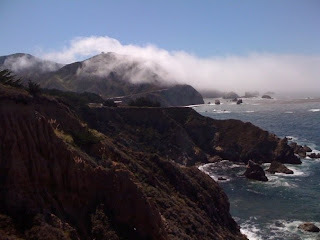 To Pfeiffer Beach, which our indispensable Insiders' Guide says is accessible via a poorly-marked road. Try unmarked, two-mile, one-lane that winds through woods and past turnoffs marked PRIVATE and KEEP OUT and BEWARE OF DOG. The beach is glorious. The sand is purple. Not deep purple, but the top edges have a purple tinge. This is the beach featured in the Elizabeth Taylor-Richard Burton movie The Sandpiper. One end is all rocks and we climb them. 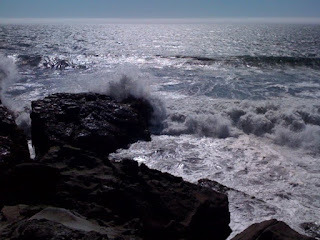 Soon I'm sitting on a large rock that slants sharply down, watching the waves crash below. If I lean too far, I'll die. Drinks in Carmel at a working-class bar where the bartender's second job is selling laser sights to the military. He gives us a catalog. A contractor in for a beer says times are tough--the building of spec houses has slowed to a crawl. Later we'll pass a realtor's office with an ad in the window for a $13 million Pebble Beach home. To the tapas restaurant Mundaka with friends we met last year at the jazz festival. Kevin Smith is a writer and student of Tai Chi; his partner Jeffrey Mallory works with computers. Together they care for artist Emile Norman. They have concert tickets for 8 or we might still be talking, drinking tempranillo, eating squash blossoms in caramel sauce. To Carmel's public beach for the final fading moments of the sunset. How do people with homes on the ocean get anything done? Don't they want to look out the window every second? A movie back in Monterey. In this early-to-bed town, we have the theater to ourselves.